Making content accessible to people with disabilities online begins with making all types of files compliant from the start. Do you have links to Word documents on your website? If so, be sure your Word documents are compliant. FAIL: Word document contains a graphic without ALT text. FAIL: Document file name contains spaces. 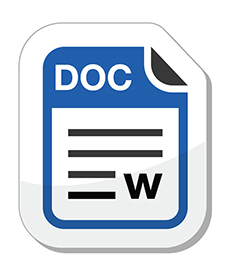 PASS: Use dashes (-) to separate words in your Word file name. Keep the total number of characters in the file name between 20-30. FAIL: Word file info is not complete. PASS: Fill in the Document Properties for Title, Author, Subject (AKA Description), Keywords, Language, and Copyright Status. FAIL: Document contains background images and watermarks. PASS: Be sure the document is free of background images or watermarks. FAIL: Color is used as a way to instruct. Colorblind visitors may not able to follow the instructions when reading your Word document. PASS: Use an instruction description that does not depend on color. FAIL: Table data created using manual tabs and/or spaces. PASS: Use the Insert Table option to create tables. FAIL: Track changes have not been accepted or rejected and turned off. PASS: Turn track changes off before publishing your Word document to the Web.